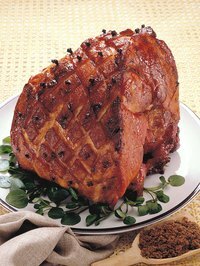 Ham is a savory main dish that can stand on its own when baked without any additional flavors, but the smoky, salty flavor is improved with the addition of sweet ingredients that make up a glaze. Typical glazing ingredients include fruit, fruit juice, brown sugar, honey and corn syrup and are basted on the ham for the last half hour of baking. These sweets help create the base from which a sweet ham gravy is made. Place the ham cut side down in a baking pan. Add the cup of water to the baking pan. Put the ham into the oven and bake for 22 minutes per pound or until an instant-read thermometer indicates it has reached an internal temperature of 160 degrees Fahrenheit. Mix together the marmalade, pepper jelly and corn syrup. Begin to baste the ham with the spicy glaze when it is approximately 30 minutes from being done. Remove the ham from the baking pan when it has finished cooking. Scrape up the bits of ham from the baking pan. Pour the sweet glazing juices, ham drippings and ham bits from the pan into a large sauce pan. Mix 2 tbsp. of cornstarch with 1/4 cup of cool tap water. Bring the pan liquids to a boil, then stir in the cornstarch and water mixture. Stir until the liquids boil. Boil for 1 minute to thicken the gravy. Fruit flavors that go well with a savory ham include orange, pineapple, cherry, apple, plum and apricot. A good sweet and sour choice is mustard and brown sugar. Sometimes the glaze is made spicy with chili peppers, or will have rum or red wine added. Choices for flavoring a savory ham with a sweet gravy are virtually endless. Placing a small amount of water in the bottom of the roasting pan keeps the ham drippings from going dry and scorching the ham.